Most of the non-fiction I read has an element of nature writing about it, but this book is rather more than that. Farley and Roberts aim is to reclaim and celebrate the edgelands that surround our cities, and the book is a fascinating account of the way landscapes are developed either by human intervention or by nature reclaiming what is left behind after human activity. Both writers are poets, so the book is inevitably reflective and personal, despite the joint authorial voice which makes it impossible to deduce who wrote which parts of it. Many other poets and artists are cited.Each chapter has a one word title encapsulating its theme - most of them specific human activities ranging from den-building and mining to hotels and airports, and the whole makes a fascinating portrait of the England that many of us take for granted. Loved it. A fascinating traipse through those areas which are certainly not rural but are not exactly urban. The two writers are both published poets and this is certainly very clear though not in a forced look at us we are poets and cannot speak unless its in poetic imagery and purple prose type way. They have beautiful turns of phrase, they quote fellow poets and their imagery often enhances and cetainly challenged my preconceived ideas. The areas dealt with range from the ruralish aspect of woodlands and paths which might still cling on or encroach on the edge of our cities through the ex lands of disused mines or power stations or landfill to the huge anonymity of retail and business parks and hotels. Chapters in handy 10 page chunks or so make it perfect for extended moments when you know the moment cannot last beyond five or ten minutes but it also is a lovely explore in which to immerse yourself. A clever book which doesn't tell you what to think about a vast array of subjects such as light or air pollution or increased commercialization or the tension between improvement and preservation but gives you the opportunity to view them from a vantage point which I for one, may not have had before reading this book. Personal explorations and childhood recollections by the authors (united into one voice), plus a good trawl of references to writings, art and photography informed by those 'edgelands' which border the city proper and the "countryside"), seen only as edges if, as usually, simply travelled through, but as territories in their own right when imaginatively visited. At the quarter way through point, this is enjoyable and easy to read, succinctly chaptered into subjects (e.g. "Dens", "Containers", "Paths"), and each chapter chunked into paragraphs with spaces so as not to wear out the typical modern reader. Both authors are poets: the blurb refers to them as "well known poets", a phrase which is a crime against literacy, since if they are "well known" it seems insulting to both them and the reader to assert the fact. As poets, they point out that poetry often deals with the mundane and overlooked, which they do here, and too they have some witty images and asides (which possibly signifies some modern poetry). How one may long, however, for a writer to realise that in dealing with liminal issues a liminal discourse, a refreshment is required rather than a tarted up trudge through familiar banality. To be fair, the method of working is to "snapshot" - as image (beyond concept), concept (abstracted from image) and metonym - a particular scene and move on quickly, to thereby evoke a running contrast between looking and seeing, between fast time and slow time; plus, for those of us who still wander wastelands and edgelands - literally and through the places of the mind - there is the delight of recognition; for those of us whose childhoods were spent in these places there is a deeper delight. Perhaps a way of expressing the book's method analogically is suggested in the authors' discussion of artist Edward Chell and his paintings of motorway verges: He has described the powerful visual metaphor of the verge as poised between the ordered, policed and restricted boundary spaces of the state that we are only allowed to look at travelling at great speed, and the slower, uncontrollable energies of nature.... (His images) suggest our perception in flux: the way, seen at speed, the intricacies of grassland and vegetation shift in and out of focus as our relation to the incident light changes. Because Chell is interested in vision, how we look at (or don't look at) what lies all around us. His paintings concentrate our gaze on what's usually fleeting and reduced to blurred texture; at the same time, their stillness seems to contain speed, and its shifting effects of light.Clearly, there is a central focus upon what for brevity's sake nay be termed 'the ideology' of land and landscape, the borders and powers of governments and private power, and the acts of subversion represented by edgelands and the human activity that takes place there. Also there is, in the thesis itself, a radical questioning of the conservative gardening of 'beauty' and order, and thence an interrogation of the ideology of 'aesthetics', and an oblique suggestion of the tawdriness of 'beauty' on the one hand, and the 'beauty of ugliness' on another.Some of the laddish wit irritates, imagery seems clever and abstract by and large rather than 'fleshed out' as one would indeed hope from poets. Perhaps the better reflections and refractions are conceptual rather than poetic. A discussion of an evolutionary term 'progressive detachment', for instance, is offered as a 'beautiful, poetic, idea', yet it may be better formulated as sharing the beauty of mathematics. In science, the authors state, "metaphors change... in an attempt to be more faithful to the evidence"; presumably, an analogy is being suggested by which new imagery needs to be found to express new discoveries (such as the edgelands). As I've said, the whole discourse of this book, and the imagery in particular, is pretty much off the shelf and lacks a fresh approach.Possibly some sort of category error has been made, firstly by trying to catalogue 'edgelands' into discrete categories; secondly by identifying them too closely with their physical location. One would have thought that by nature, edgelands are not subject to classification and territory (and hence the requirement of a more adventurous mode of expression). Strangely unpeopled except by monolithic categories of types (e.g. families en route to Benidorm or Ibiza at airports), the authors share that peculiar modern sensitivity to what they perceive as any charge of misanthropy (early on they dismiss attempts to dismiss edgelands in favour of transcendental trips to the Highlands, or as evidencing edgelands as showing the mess we have made of the planet as "shortcuts to misanthropy"). The edgelands in this book have a ghostly quality that, I am sure unintentionally, leaves out the human and exploits a detritus of attributes, dislocated and disconnected.All landscapes are imaginary, cities are imaginary. As the writers say, "we can concentrate on the local, the immediate, and devote our attention to a few square feet of earth." And rather than having to find edgelands in the obvious geographical border between town and country, we can see them wherever we are, wherever there is human activity. There are many strata of populations in all our cities, and the demographic metaphor is apt. We live in edgelands whoever, wherever we are. I dearly wanted to enjoy this book. The liminal space between urban and rural--formal and unformal, order and chaos--that Farley and Roberts speak of is a place I spent far too much time snaking about in during my teenage years. I already adore the 'edgelands', so a book exploring and re-evaluating them seemed perfect.What I found, unfortunately, was a series of over-romanticised, over-generalised, and meandering tangents--only rarely insightful, clever or poignant. I could count on two hands the amount of times a segment genuinely hit home, or evoked something within me. Edgelands is as wild and untamed as the void it seeks to venerate--it truly has no business being almost 300 pages long.That said, I very much enjoyed the flickers of technology that popped up in discussion: how over-reliance on GPS systems has paradoxically created a chaotic series of vehicular paths in space via satellites, how the rise of shipping containers helped shape the edgelands (and how pallets are 'magic carpets with rigour mortis'), how the suitability of ruins for skateboarding has translated into video games such as Tony Hawks recreating their own virtual edgelands (Foundry anyone? ), how people wishing to trigger their own dawn choruses with pre-recorded bird call apps are destabilising habitats, etc, etc.These are the elements that had legs--I don't want crass generalisations about the youth (that apparently homogenous group that the authors clearly have little connection to) and their relationship to the edgelands; neither do I want over-egged calls back to the youth of the authors (no offence boys but your nostalgia does not translate into my caring). I want to feel something in the landscape, outside of people. I want to feel the decay of time, the reclamation of these spaces by nature. Perhaps W. G. Sebald ruined English travel fiction for me with his gut-punching Rings of Saturn, but this doesn't even come close. A very disappointing book. I bought it expecting to enjoy a series of prose-poems evoking the strange attraction of city margins. Instead I found a series of pseudo-intellectual essays about the different things to be found there. There was little sense of the particular just the authors' generalised (and often irritating) whimsy. I shall not be keeping this book. Beautiful and engrossing. Psychogeography is a battleground -- you've got social commentators using it, and artists, and occultists. These authors, being poets, do their bit here to stake a claim for the right of poets to use the psychogeographical kitbag. There are some asides, early on, about the 'miserabilist' tendencies of 'psychogeographers' -- a not-so-suitable dig at the likes of Iain Sinclair and Will Self. The book thus sets out its credentials as more inclined to beauty than socio-cultural critique. And there's nothing wrong with that.The writing and observations are very beautiful, with those bright splashes of shocking originality that only poetry can do. But I don't think they escape entirely their own accusation of 'miserabilism', especially in some of the later chapters examining the effects of commercialisation and commodification upon the landscape. Could it be -- shock, horror -- that psychogeography is something more than a well-defined 'sense of place', which poetry has always found itself so well-equipped to evoke? Perhaps the psychogeographical kitbag has a logic all its own, which leads one inevitably into critique?I think this accounts, perhaps, for the authors' choice of scope -- the 'edgelands'; spaces not quite in the city, because -- in the city -- it would be harder to escape the impression of a critique or challenge to the established order. It's harder to say things about urban spaces without positioning oneself either inside or outside the consensus view. The edgelands, however, afford a certain aesthetic distance. Occultists (for instance) love these spaces, because they provide a refuge and a cover for their activities outside the mainstream. For the artist or poet, however, I suspect that they offer more the attraction of being neither inside nor outside.But all of that aside, poetry still kicks arse when it comes to an evocation of the sense of place. The beauty and sensitivity of this book are more than enough to carry it through. Though I was at times slightly frustrated by the uncertainty of this (never was 'edgeland' convincingly defined for me - it seemed to just mean 'anything town or country that the authors wanted to define as such') and though it did wander off into pretentiousness at times, I did enjoy this.The co-authors discuss various aspects of the British landscape, focussing on boundaries and hinterlands. Allotments, canals, dumps, wastelands, retail parks, and many more.. it's a curiously put-together mixture of poetry, academic review and diverse discussion that worked best when it was being generic (though I did get added pleasure from some of the West Midlands sections I was familiar with). At times it took itself too seriously, I felt, and there did seem to be sweeping statements early on which failed to convince me, but most of it was good. There were parts which I really enjoyed, parts which I felt myself gloss over and barely take in.. but overall it was a pleasant and interesting read. After an intro which nearly put me off altogether (its 'we' made it feel far too much like a manifesto), this settles down into a charming celebration of the pleasures of overgrown nowheres-in-particular, and why mothballed building sites make the best playgrounds. Like Iain Sinclair, the authors are both poets, but their prose isn't quite so dense for the sake of it, and nor are they such thoroughly miserable sods. Paul Farley and Michael Symmons Roberts introduce us to a part of our world that we had long forgotten even existed.This unlikely addition to my bookshelf was recommended to me by someone who has since gone off on travels to Shangri La in a hot air balloon, but when they return, I shall be sure to express my unending gratitude for their counsel. Edgelands is a series of journeys into the parts of England’s wilderness that we are all accustomed to either ignoring or looking past. Neither the town nor country; but spaces ‘...where urban and rural negotiate and renegotiate their borders...’ They can be places that we don’t want to see, like power stations, sewage works or landfill sites; places of former industrialisation that are now sites of intense retail competition for weekend shoppers; or even simply undeveloped wasteland.The authors, who visit many different edgeland areas draw on history to explore what has happened to these places, and then explore what they are used for now, even reminiscing about their own childhood memories – which, quite often, has the effect of bringing memories of your own flooding back. You’ll find yourself not only picturing the scene they’re describing, but also trying to remember a place from your own past that says the same thing. 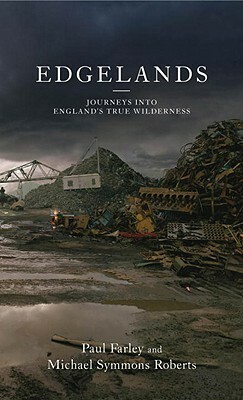 They give us an insight into the changing nature of England’s towns and show how the edgelands have, even within their own lifetimes, transformed; moved; even been occupied by the diverse wildlife.Both authors are accomplished poets themselves and also draw on the poetry of others, as well as art and literature to try and shine a spotlight on what they believe is the beauty of the edgelands, both the natural and the not so natural. They achieve their goal with resounding success; now, I can’t even take a train ride or a bus out of town without gazing out of the window at the edgelands of the north east and wondering just the same things that Farley and Roberts do in this book.With each chapter devoted to a different subject (many of which are inextricably linked), the book is not a linear journey from the first page to the last, it is not chapter after chapter of simply describing particular places either; there is also much of their explorations in the process of writing the book. Documenting visits to the many places they write about; an outlet village, the Birmingham NEC, a pallet yard: “A book?”, “Yes, a book about the edgelands.” “The what?” “Pallets. It’s about pallets.”Edgelands is a wonderful insight into long forgotten about places. It will give you a greater appreciation for the things you never notice. But most importantly, it’s just a fascinating and enjoyable book to read. For someone who has always been scared of abandoned cars on the side of a-roads, this book was always going to at least hold my attention. The authors are fascinated by the spaces between the urban and the rural and do well in attempting to break down this particularly prevalent binary by focusing on all the bits that don’t fit. Given that the authors are poets with university affiliations rather than geographers, this is more about imaginative space than physical.This reads more like a poetry collection than a sustained polemic, which is a good thing in my view. The authors flit between ideas and ponderings effortlessly, using the single worded chapter headings (Wire, Ruins, Woodlands, Canals, Containers etc) as springboards for thinking about what these non-spaces mean, what they symbolize, what they do, how they make you feel. The authors draw on a range of poets, artists and architects to prop up their own ideas, but dodge po-faced intensity for foolish, often tongue-in-cheek romanticism. Tellingly the authors are often scathing in their off-hand criticisms of “so-called psycho-geographers”; they are poets with little to no interest in meaning.This book is at its strongest in its evocation of the English landscape. If Wordsworth lived in modern-day Wigan and was charged with sending occasional editorials from the car park of the abandoned Big W warehouse on the edge of town, he may have produced something like this book. The authors are less convincing however when any actual people trespass in their imaginative wilderness. In one chapter they pay lip service to an ‘interview’ with a night warden, but seem less interested in him than what he represents. In another chapter, a receptionist at a pallet yard on the edge of Birmingham is bemused by the authors’ request to have a wander around. The authors’ inability to understand the receptionist’s confusion, speaks volumes about how obtuse and how irritating artists can be. In another part of the book, the authors tell a story about how Auden would get excited about meeting minors, but found it difficult to sustain a conversation with any of them. This is a unique and personal collection of meandering and often beautiful, poetic prose. The authors find transcendence in the most mundane of landscapes, but fail to make a connection with the lived experience of those who pass through them. brilliant; really enjoyable read. i loved the way they constructed thought patterns through their use of language to explore the edgelands. Their sentence construction, short chapters, made it hugely informative and enjoyable. Bought as soon as it came out on the strength of a 'Spectator' review. Was more entranced by the language than I anticipated and I really need to read it again. Beautifully written book by two poets. It describes the landscapes at the periphery of towns where the urban meets the rural. Well worth reading. This is a book about those scrappy, overgrown and generally unloved piece sof land that no one seems to really notice or care about. They may have once had a hous eo or a factory standing on them which has long since vanished. Or the piece of wasteland was just never owned by anyone. They’re often on the edge of towns, villages, industrial estates or retail parks. But they can provide powerful habitats for wildlife as I have discovered for myself and the authors of this book describes them as the last great wildernesses. Paul Farley and Michael Simmons Roberts have travelled all over the UK looking and exploring these often bramble filled sites and along the way introduce us to the hidden world of abandoned pallets, ruinsm sewage farms, containers and piers amongst others. In the introduction of this slim volume there is a lovely description of a car scrapyard full of rusting, decommissioned vehicles a s ‘’’the equivalent of the Paris catacombs’ The authors also describe their invention of the edgenav which is the opposite of the satnav in that its purpose is to guide travellers away from the unconventional and into often uncharted territory.Edgelands is full of nuggets of fascinating information and characters such as the US ex-café owner, Arthur Blessitt, who took to the road with a 12 foot cross after hearing the word of God. At the time of the writing of this book he is still doing it 40 years and 38,000 miles later. Also how shipping containers inspired Mark E Smith of The Fall and the way in which the edgelands can encourage poets such as Robert Lowell who wrote a poem after observing a skunk family scavenging for food scraps. Also have you ever wondered why Tomato plants grow in profusion near sewage farms – this book will tell you. The description of the contents of an allotment shed felt like a description of a still life painting. I was also particularly fascinated by urban hermits looking for medicinal wildflowers to boil up as tinctures or concoctions to drink and I also learned the correct term for the black and white patterns that used to dance across TV screens after the stations has closed for the night (remember that?) Apparently it’s called shash.A very entertaining book and although I do explore these pieces of wasteland usually in the summer looking for butterflies and moths I will look at them with new eyes. I haven't read anything this 'academic' since my university days but I was pleased to found I enjoyed it overall. The book treads a fine line between a poetic expose and scholarly 'place based' commentary. At times this wanders well away from the beaten track into general societal and historical discussion but overall this probably adds to its charm as a set of off-beat observations that don't quite fit into a specific genre (a bit like the edgelands themselves I suppose and probably the whole point of the book). Given its meandering and deliberately 'dull' topic and its academic examinations, it was quite dense and tough to get through at times. However, highly recommended read for anyone interested in places (but not necessarily 'travel'), human geography or town planning. A 'thinking' book, not necessarily an entertaining one. When I was younger I fancied myself as something of a singer-songerwiter. Sat in a pre-fab in Camberwell I composed many angst ridden songs in A minor. One was called “Waiting for the Ragman”. The final chorus went: You head out for the blacknessAround the edge of townYou hit the local graveyardTo see what’s going downIn the country of the bilndThe cyclops wears the crown.A year after I wrote this Bruce Springsteen released "Darkness On the Edge of Town". I was convinced that everyone would imagined I’d knicked one of his lyrics, so I binned the song. Anyway I digress. The point I am making in a very roundabout way is that I have always had a fascination with the edge of things. The penumbra. The area which lays just outside the glow of the fire.Edgelands in that respect, is the ideal book of me. Written by two poets - it is not what you would expect. It is not written in a particularly poetic style. Although I suppose we could argue on that point! What the authors bring to the prose, is the poets eye for the extraordinary in the ordinary. Chapters such as “Pallets” make you look at the most ubiquitous of modern objects in a new way. Although this book is relatively slim, it is bursting its covers with information and detail. It also acts as a signpost to other authors, artists, photographers and so on. However, I have to point out, when I read the first chapter, I wasn’t sure whether I would continue. It wasn’t quite what I was expecting. But, I persevered and I’m glad that I did, because I really enjoyed this book. It does take you on a trip to the periphery of our urban world. To places you only occasionally visit or work in. It un-blurs the darkness in a very interesting and humorous fashion. blurbs - Poets Paul Farley and Michael Symmons Roberts explore a wilderness that is much closer than you think: those debatable zones that are neither town nor countryside. These two lyric poets celebrate the strange beauty of these places that we all journey through, but generally fail to acknowledge.Recorded entirely on location in the English edgelands, this Book of the Week journeys through the post-industrial landscapes of ruined warehouses, landfill sites, retail parks, sewage works and power stations. Edgelands is published by Jonathan Cape (27th February 2011). It won a Royal Society of Literature Jerwood Award for non-fiction in 2009. Paul Farley is the author of four collections of poetry - including 'Ice Age' - and has received the Forward Prize for Best First Collection, the Whitbread Poetry Award and the E.M. Forster Award from the American Academy of Arts and Letters. Michael Symmons Roberts has published five collections of poetry - including 'Corpus', which won the Whitbread Poetry Award - and two novels. He is a frequent collaborator with the composer James MacMillan and their opera, 'The Sacrifice' won the RPS Award. Thoroughly enjoyed this book. I know Farley is a "John Clare" Man & the great rural poet gets a fair few mentions in this book & the spirit of Clare is ever present. There were times that I did not follow the links in the book as the connections between topics was rather loose but this did not deter from the poetic descriptions and the humorous observations. I went for a cycle ride along an old railway line last Sunday. I crossed the River Trent over a viaduct & had wonderful views of the power stations along the Trent valley. There appeared to be armies of electricity pylons heading in every direction. I passed all types of derelict land of unknown previous use with warning signs about staying out of this potentially toxic land. It was a botanists dream with a huge variety of plants, many in flower. I scared a buzzard out of a tree, heard the song of yellow hammers & saw many flurries of little brown jobs as I hurtled along on my bike. This was edgeland country at its beautiful best so wonderfully described by Farley & Symmons Roberts. My digital camera has broken & I have wondering when to get a new one. Reading this book has made me want to buy a new camera & go exploring round Lincoln & its edgelands & trying to capture these images on my new camera!!!!! A brilliant exploration of those spaces which are neither countryside nor town/city, & which are largely ignored or missed by most of us, as we pass them by on our way to & from places. Poets Paul Farley & Michael Symmons Roberts take the reader on a journey through these forgotten wastelands, some empty, others over-developed, which exist on the outskirts of the places we live.Within chapters headed "Dens; Sewage; Canals; Woodlands; Pallets; Retail; Weather", we are transported into an alien yet familiar landscape that most of us never give a second thought to. Beautifully conceived, quirkily written and observed, this is much more than travel/nature writing...more "literary photography".I loved it! In part, I am to blame for not enjoying this - a cursory glance at it led me to believe it was about urban fauna and flora, so my expectations were way off the mark. Nonetheless, I failed to be won over by this whimsical sprawl. There are next to no facts in this book, but nor are there any mind-blowing ideas, just half thought-out, empty-headed meanderings and conjecture, which run out of steam very quickly. It is telling that no section lasts more than three pages before shifting focus, the two writers having tried to glorify the mundane and been found wanting. The entire book drifts along, not building to any sort of manifesto or offering any thought-provoking insights. Very interesting wander through those parts of the country that are so often overlooked, ignored or vaguely registered as we fly past them. But they often tell us far more about our society and our attitude to countryside and wildlife than the more built up or preserved parts. The scruffy, ignored bits are often those that wildlife of all kinds like the best yet the bits that people often think of as spoiling the view. This is a fascinating exploration of these areas - cultural, historical, poetical as well as descriptive. I liked the structure which is almost like a stream of consciousness. An interesting accompaniment to Richard Mabey's "Weeds". I know everyone thinks this book is so great and it's on a subject that interests me but I found it boring. It just rambled on and on and on. The writing style irritated me. It reminded me of a certain type of academic who you wonder how they get away with their consistent vagueness. I think the contents could have made an interesting essay but didn't warrant a whole book. I lost patience halfway through and stopped reading so maybe it got better but I'm guessing it was just more of the same. A fascinating book, sort of a Poetics of Space for the overlooked areas between the city and the suburbs, marginal land formerly occupied by industry or currently occupied by business parks, weather stations, or big box stores. Farley and Roberts are remarkable writers with a wry sense of humor; foremost, though, they are excellent tour guides, offering a glimpse into a portion of the landscape most of us overlook. Not as enjoyable as I hoped, I think I was expecting something more in the Seybold vein. Some lovely writing, thiough, and the book is a fantastic gateway to various artists and poets who have celebrated the edgelands in all their forms through the ages. Some of the conceits are a stretch and feel laboured, but I certainly found enough here to illuminate even if I was never dazzled. Funny book this - written by two poets, it feels more like a loose collection of thoughts and prose rather than a fully formed book. It's almost as if I'd stumbled across their notebook. Some really interesting thoughts and views, though, on our less-celebrated areas of nature, and certain parts reminded me of playing in these "edgelands" during the summer as a kid... Worth a read.